Changing health insurance plans can be daunting with diabetes. Tracking down various prescriptions, organizing paperwork, making phone calls to providers and device suppliers, and updating information at pharmacies is a headache for anyone. Whether you’re changing jobs, moving to a new state, switching to Medicare, or turning 26, there are ways to avoid losing your health insurance at any point during the transition. The sections below aim to guide you through the process of preparing to switch insurance, no matter what type of transition you’re going through. If you are changing jobs, start planning at least four weeks before you give your notice so that you are prepared to ask your current employer for the information you need. If you are switching insurance because you are turning 26, start planning several months in advance. 2. You will need to devote some time to gather documentation, research and select new plans, and make phone calls. Depending on your specific situation, you may need to spend anywhere from five to twenty or more hours on this process. Contact information (email address and phone number) for the individual in your employer’s Human Resources (HR) Department who has information about the health insurance plan. If you are changing jobs, get this contact information for your old and new employers. Phone numbers for the following people: your healthcare provider(s), your current insurance company (you can find the number at the back of your insurance card), your pump company, your CGM company, your pharmacy, and any of the other providers you have. 4. Track all communications you have with your insurance company, employer(s), and device companies. Whenever you call anyone in the list above, be sure to ask for the name of the representative you are speaking to, and write down the date and time of the call. If you are given a case number, make sure to write this down, too. The next time you call, ask to speak with the same individual you spoke to previously and reference the date and time of your previous call. 5. Keep track of key dates, such as the date your current insurance ends, the date your new insurance starts, and the date your transition plan starts and ends. 6. Don’t forget about your health needs beyond diabetes! Write down the entire list of medications, medical devices (like pumps, monitors, and strips), and health care services you use, including things like mental health counseling, birth control, and physical therapy. Make sure you have contact information for each provider you visit, and add this to your list. Changing jobs is one of the most common reasons that someone might need to switch insurance, as almost half of all of Americans (49% in 2017) have employer-based health insurance. If you have employer-based insurance, make sure to understand your rights at work, whether at a new job or current one. For more information on maximizing your health benefits at work, read diaTribe’s article on employee rights for people with diabetes here. Remember, you are not required to tell a potential employer that you have diabetes. After a job offer is made, employers may ask questions about your health and your diabetes, but they may not withdraw your offer if you are able to perform essential job functions, with or without reasonable accommodation. Ultimately, your employer cannot discriminate against you because of diabetes. For more on your rights and disclosing diabetes to future or current employers, click here. Below is a series of steps to guide you through the process of changing jobs and switching insurance. STEP 1: As soon as you have an offer from a new employer, make sure to ask for details about the health plan in your benefits package. Though employers are not required to give you the full “Summary of Benefits and Coverage” (or SBC) until you are hired, they typically can share other benefits summaries that include details about the health plan’s coverage and monthly premiums. An employer is required to provide a full SBC after you are hired and first enroll in the health plan. STEP 2: Compare your potential employer’s plan with your old plan. Don’t hesitate to reach out to the HR department or call the new insurance company directly if you have more questions. To find out whether specific products – including branded insulins, devices, and durable medical supplies like pumps – are covered, call the health insurer’s customer service line or use its mobile or website (you’ll need to login). You can also request to see a drug “formulary” (or list of covered drugs) to see all of the plan’s covered prescription drugs. Different plans may offer different brands or models of drugs and devices (one insurance company may cover LifeScan strips instead of Abbott FreeStyle strips, for instance). If you use an insulin pump or CGM, call the pump and CGM manufacturers directly. These companies should have trained professionals who will be able to help you advocate for yourself with insurance companies. When examining the new plan, it may help to try to calculate how much you would need to pay out-of-pocket for your medical supplies, insulin, and devices like CGM. Again, you can typically do so by calling the health insurer’s customer service line or using its mobile or website (you’ll need to login). Consider whether you would feel comfortable switching to different brands or models if required, and talk with your healthcare provider about what this switch would mean for you. It’s important to determine whether you would have to switch and whether your diabetes supplies will cost more, especially if the cost is higher than any pay raise the new job offers. If your new plan initially refuses to cover a device or treatment that you believe is essential for your diabetes care, you can attempt to appeal the decision once you have switched over your new insurance. For information on appeals, click here, and for more tips on comparing health plans and understanding employer-based health insurance, click here. If a new job’s coverage is worse than your old job’s plan, this may be an important factor in any salary negotiations. If you are unable to negotiate higher pay in the face of worse coverage, carefully consider the potential cost of your diabetes supplies. The majority of employer-based plans should be affordable, as all US employers with more than 50 full-time employees are required to provide health insurance that meets certain standards of affordability. Nonetheless, it may be worth comparing the employer’s plan to plans offered in the Marketplace on www.healthcare.gov if your new employer’s option seems unaffordable. Keep in mind that you most likely won’t qualify for savings under the open market plans if you have an offer of job-based insurance. For more information, click here. STEP 3: Ask your potential employer’s HR department about the timeline, out-of-pocket costs, the healthcare provider network, and access to other health benefits such as prevention programs, vision care, and foot care. A waiting period: Be sure to ask how long it will take for your new health plan to kick in. There is generally a waiting period for new plans to begin, but the length of time can differ based on state and employer. Under the Affordable Care Act, all employees must be eligible for their company’s health insurance plan within 90 days of the start date. Deductibles, copays, and out-of-pocket maximums: If the plan is high-deductible, ask if the employer offers any assistance programs like Health Savings Accounts (HSA) or Health Reimbursement Accounts (HRA). For more information on understanding terms related to health insurance, like benefits, premiums, and deductibles, click here. The network: Check to see if your current providers are in the new plan’s network. Depending on the type of insurance offered (HMO, POS, PPO, or EPO), out-of-network services may not be covered or may have higher out-of-pocket costs. Ask to see the “provider directory” for the plan’s network so that you can see whether your current healthcare providers are in-network. If they are out-of-network, you may have to pay more to see them. 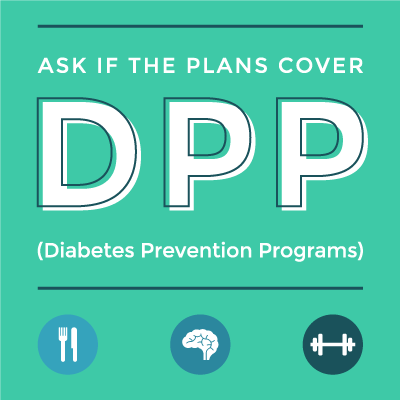 Access to DPP, discounts and other health benefits: Many employers provide access to Diabetes Prevention Programs (DPP). Some companies also offer wellness discounts or incentives for workplace wellness programs or health screenings. Click here for more tips on what benefits to look out for. Coverage of vision care and foot care: Taking care of your eyes and feet is important when you have diabetes. You can call the health insurance company directly to find out more about their coverage for its services. STEP 4: Find out how long you will be covered under your old insurance plan, and compare the last date of your coverage to the date your new health insurance will take effect. Some health insurance plans end the day you leave your job, while others end on the month you leave your job. In the latter case, you may be able to retain coverage for over a full month if you leave on the first or second day of the month. To maximize the amount of time you have coverage, make sure to give notice only after you’ve worked enough to cover the entire upcoming month. Each plan is different, so ask your HR department for the exact date your old coverage will end. STEP 5: Look into the options for filling the gap between your old and new coverage, and select the best choice for you. Starting in 2019, anyone who does not have health insurance will no longer have to pay a fee. This means there is no longer a “health care mandate” or “penalty” for going without coverage. Having coverage during the gap between your old and new insurance plans, however, is key for continual access to the diabetes care you need and in case of emergencies. The Marketplace: Though COBRA might be a good option if the group rate is less expensive than an individual plan, sometimes it can be cheaper to purchase a temporary plan through the Marketplace on www.healthcare.gov. Typically, you can only enroll for a healthcare plan during the Open Enrollment Period (November 1 through December 15). However, losing job-based health insurance is a “qualifying life event” that makes you eligible to select a healthcare plan through the Marketplace during a Special Enrollment period (SEP) outside of open enrollment. Other qualifying life events include turning 26, getting married or divorced, moving to a different ZIP code or county, or changes in income. In order to be considered for SEP, the qualifying life event must have occurred in the past 60 days, so be sure to explore this option as soon as possible after a change happens. See all qualifying life events here. At a minimum, all Marketplace plans must cover the same set of essential health benefits, which are listed here. When you shop for temporary plans on the marketplace, make sure to consider some of the key characteristics that you thought about in Step 1 – whether your current doctor(s) are in the new health plan’s network, whether your medications, devices, and supplies are covered, and what coverage is offered for diabetes education, vision care, and foot care. To find out how to check whether the plan offers these services, read our full guide on choosing health insurance through healthcare.gov. If you plan to purchase a Marketplace plan only temporarily, you can begin taking steps to cancel your plan once you know the date your new coverage will start, as you can set your Marketplace coverage end date to end fourteen or more days in the future. Depending on who is leaving the plan (just you or you and your dependents), coverage will either end immediately or after a period of two weeks. To make sure that your plan will end on your preferred date, call to request the change at the Marketplace Call Center. To cancel your plan successfully, carefully follow the specific instructions on Healthcare.gov by choosing the reason you’re ending health coverage. COBRA: The “Consolidated Omnibus Budget Reconciliation Act” (or COBRA) is a federal US law that allows employees and their dependents to retain access to their employer-provided health insurance for a period of 18 to 36 months. With this temporary health insurance, or “COBRA continuation coverage,” employees can have the same coverage and access to the same healthcare providers during the transition between jobs or after other certain major life events (including reduction in hours worked, being fired, divorce, and death). Though coverage will be the same, health insurance under COBRA may be very expensive because ex-employees typically pay 100% of the premium costs under COBRA. Employers are required to provide a notice about your COBRA eligibility after you tell them that you will be leaving your job. The employer’s notice will typically tell you that you must elect whether to use COBRA by a certain date, so be sure to keep track of the time you have to make to your decision. If the waiting period before your new job’s coverage begins is short, it may be easiest to use COBRA to cover the gap, as you won’t have to worry about switching plans and providers until your new coverage starts. Under COBRA, you can ask to pay your premiums on a monthly basis, allowing greater flexibility with upfront costs. Some plans may even allow payment at weekly or quarterly intervals. To find out more information about COBRA continuation coverage, read our article on understanding employer-based insurance. For more detailed information on COBRA, click here for the US Department of Labor’s “An Employee’s Guide to Health Benefits Under COBRA” and here for answers to frequently asked questions about COBRA. Catastrophic plans: A Catastrophic health plan offers coverage mainly for avoiding high costs as a result of getting seriously sick or injured. These plans have low monthly premiums but very high deductibles ($7,900 for 2019) and provide coverage for the same essential health benefits as other Marketplace plans, preventive services, and at least three primary care visits per year. Anyone under 30 years old can enroll in a Catastrophic plan but those over 30 must qualify for a “hardship exemption” in order to enroll. Hardship exemptions for 2019 are detailed here and anyone who experienced hardship beyond the situations detailed can apply for an exemption by explaining their individual situation here. Though Catastrophic plans are more geared toward serious life circumstances, particularly related to not being able to afford health insurance due to an abrupt change in one’s financial or life situation, you may want to explore this option as you are deciding which option to choose. Join a spouse’s or a parent’s plan: If you have a parent living and you are under 26 or have a spouse with employer-based or Marketplace coverage, consider joining their plan either temporarily or for an extended period if possible. If the spouse or parent is on a Marketplace plan, you have the right to enroll in their plan without waiting until the next enrollment period, as this situation counts as a “qualifying life event.” Similarly, companies are typically required to offer the spouse an opportunity to enroll in their insurance plan at any time – even outside of the company’s specific enrollment period – if the spouse has lost coverage under another employer plan. Consider alternative options for children: If you have children who are your dependents and it looks like it will be too expensive to cover them through your temporary plan (whether through COBRA or the Marketplace), you may be able to obtain coverage through the federal Children’s Health Insurance Program (CHIP) for little to no cost during the transition. CHIP offers coverage for children in families that earn too much money to qualify for Medicaid and covers pregnant women in some states. Be aware that some states may impose a waiting period for three months or more from the date when the child was last covered by your employer-based plan, so this may not be the best option as you will still have a gap. Check your state’s policies here. 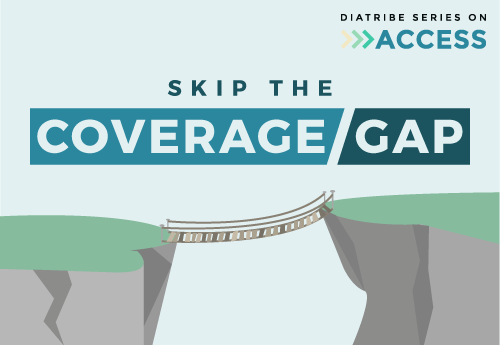 STEP 6: Once you’ve decided your plan for filling your coverage gap, start notifying your healthcare team that you’ll be switching and find out if they have any additional specific instructions. Some people you should call include: your previous insurance company, previous pump company, previous CGM company, previous doctor’s office, and previous pharmacy. Tell them that you will be switching your insurance to a new, employer-based plan, and notify them about your transition plan (e.g., COBRA or Marketplace plan). It can be helpful to call your new companies and providers as well, so that you can confirm the date that your medications and supplies will be available. Before your old insurance ends, schedule an appointment with your healthcare provider and ask for a 90-day supply of your necessary supplies (even if you aren’t due for refills) so that you have them as a back-up in case anything goes wrong during the transition period. STEP 7: If any of your healthcare providers won’t be covered under your new plan, start looking for a care team that will be in your new plan’s network. Check that they will be covered under your new insurance (you can call the healthcare provider’s office to ask). You can also ask your current healthcare provider for recommendations for someone who would be a good fit for you. During one of your last visits with your current healthcare provider, discuss any hesitations or concerns you have about transitioning. 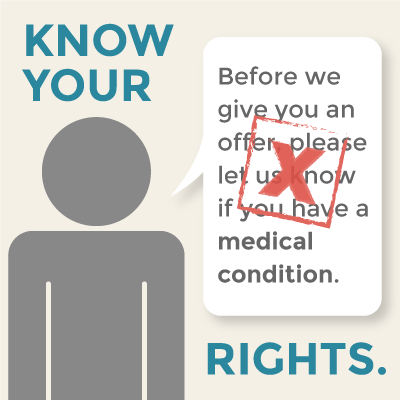 Make sure to ask your healthcare providers’ office to transfer records to your new provider. Before you go to your first appointment with your new healthcare provider, call the office ahead of time and ask what you’ll need for your first appointment. Typically, you’ll need to bring your insurance card and all of your diabetes devices (e.g., pump, meter, CGM). During your first appointment with your new doctor, share your background, history, and approach to diabetes care. If your initial impressions of your new doctor aren’t positive or you leave the appointment feeling worse about your diabetes care, consider other in-network providers. If you have employer-based insurance and are moving to a different state but keeping the same job, your insurance will typically remain the same. Check with your employer whether there will be any changes, and be sure to follow Step 7 above to look for replacements for your care team. If you have a plan from the Marketplace, your coverage most likely won’t change if you move within the same state. You need to report the change in address, however. If you’re moving to a different state, you will need to start a new Marketplace application and enroll in a plan run by the new state. Report the change as soon as possible so that you can enroll in a new plan without any gaps in your coverage – read the full instructions for moving to a new state on healthcare.gov. If you are turning 26 and have previously been covered under your parent’s plan, there are a number of important steps to take to successfully transition to a new plan. If your employer offers health insurance coverage, you can enroll in the plan outside of its yearly open enrollment period when you turn 26. Make sure to contact your HR department a few months before you turn 26 so that you find out when your new insurance will kick in, and follow the steps in the “changing jobs” section. If you do not have the possibility of employer-based insurance, you can enroll in a plan through the Marketplace. Because turning 26 counts as a “qualifying life event,” you can enroll even outside of open enrollment period. Click here for specific instructions, as you’ll have to take different steps depending on whether your parent was covered by a Marketplace plan or an employer-based plan. You may also be eligible to received low-cost or free coverage from your state Medicaid program. When you fill out an application for a Marketplace plan on www.healthcare.gov, you will find out if you qualify for Medicaid. If you do, you can get immediate coverage. If you are currently a student in a graduate or professional program, most universities offer student health plans. If this is an option for you, contact your school administrators to get more information. 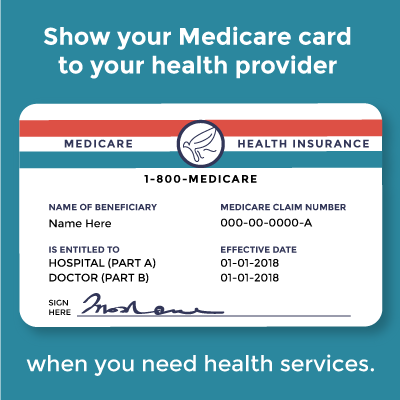 If you are turning 65 years old, you are automatically eligible for Medicare. If you are under 65 years old and have a disability, ALS (Lou Gehrig’s disease) or end-stage renal disease (ESRD), you are also eligible for Medicare. Read diaTribe’s article on “Making the Switch to Medicare with Diabetes” here. Special thanks to Mindy Bartleson for contributing to this piece. This article is part of a series on access that was made possible by support from Lilly Diabetes. The diaTribe Foundation retains strict editorial independence for all content.